This campaign is set ten years after a previous set of adventures (HERE). This is the twenty-first session of the current campaign (Session 21 can be found HERE). Last session, they had met Baku, a Kushen Tribesmen, and confronted members of Bone Breaking Sect for stealing the Face of Vaagu. After dealing with some witches, they let San and Chen (two high ranking members of the sect) join their party to help them face Fearless Cat (the leader of Bone Breaking Sect). Together they headed south to the Banyan to stop her from killing the immortals of Red Mountain Villa. The party went to Red Mountain Villa. On their way they passed ten disciples of Purple Cavern and asked them to send a message to their friends Lingsu, Min and Long Shu. They continued on and found Compassionate Monkey, the guardian of the bridge entrance, slumped on the ground. He said they’d taken everything and struck him with the Immortal Killing Sword, leaving a wound on his side that kept bleeding. They pressed him for details and he shared that a lady with the Immortal Killing Sword and a bunch of soldiers came, killed the Immortals and wounded him. They took the Phoenix Crown and the Key of Yao Feng, then headed north. Monkey said he was dying and asked Kang and Zhi Zhu to burn his body and return him to his people. He also said he had magic pills he’d stolen from heaven stashed in his homeland. If they brought him back they could have these. Back at Purple Cavern, Lingsu had been there for some time dealing with sect matters while the rest of the party had been in the north. Lady Plum Blossom went into seclusion to master the secrets of the Jade Maiden Statue. She wanted no disturbances and placed Lingsu in charge of the sect. As he was tending to daily matters, he received a message saying that his companions were heading to Red Mountain Villa after learning that the immortals were slaughtered by Fearless Cat. He packed quickly, took two disciples and head there himself. Lingsu arrived and found the party members in camp, with Monkey. He tried to heal Compassionate Monkey with Plum Blossom Palm. Initially it didn’t work but examining the wound he felt if he did it precisely, he might manage to save the creature (basically he needed a total success). Estimating that he had three hours left, he tried his best. On his third attempt, as Monkey was getting close to death, he succeeded, letting a flow of energy into Monkey that instantly cured him. Monkey leapt up and thanked LIngsu for his help. Monkey then announced that Kang and Zhi Zhu could no longer have his pills. That he had promised them when he felt he was dying, so his thoughts were unclear. The party decided to head north and track the Bone Breaking Sect. Baku attempted to follow their trail, but lost the way and they walked into an ambush. As they rounded a rise in the wilderness, a group of 32 Bone Breaker Disciples charged at them. Lingsu was able to dispatch ten right off the bat with Sword Whipping Strike and Baku used Storm of Arrows to take out the rest. Only two were still standing but they quickly surrendered. Zhi Zhu slit the throat of one of them and Monkey flew into a rage, stabbing at her for the action, calling her unmerciful. He chased her around and she asked him to teach her about mercy. However his explanation made very little sense. He seemed to think that when he killed someone it was always merciful, but that others couldn’t kill unless it was purely in self defense. Since the men had surrendered, he wanted them alive. Kang, who had declared himself the new leader of Bone Breaker Sect, asked San to speak with the 30 wounded soldiers, telling them he’d take them into his fold if they swore loyalty to him. They agreed and took a formal vow. The men then told them that Fearless Cat and the rest of the sect’s soldiers were in an encampment to the north in Zun Valley. They went there and left Ku, Monkey and Bing in a camp (because Monkey was wounded and Bing and Ku were not skilled fighters). They discussed different plans and settled on dressing as Bone Breaker Sect soldiers and having San and Chen lead them in. However Zhi Zhu would go sneak into the camp first to steal the Immortal Killing Sword from Fearless Cat. Using Stealth of the Spider Demon, Zhi Zhu made it easily into Fearless Cat’s tent. She had taken her Horse Hair Pin and dipped its tip in the wine poison they’d found in Li Fan. She then approached Fearless Cat’s bed and jabbed her in the face, running away the moment it sunk it. She heard a scream and saw activity in the camp as she fled. When she reached the party, and told them what happened, they didn’t know what to expect. They continued into the camp, with Zhi Zhu on the periphery. Reaching Fearless Cat’s tent, San looked inside and came out. She said she needed to go in and speak with the soldiers, that Fearless Cat was dead. The party went in with her and Chen. San grabbed the Immortal Killing sword and said “Arrest these people, they killed Fearless Cat”. Immediately everyone had their weapons drawn. Baku used Slicing Arrow, which struck San, then Chen, then dropped about 5 soldiers. There were still other soldiers in the tent fighting alongside Chen and San, but they couldn’t tell what was happening outside. Outside the tent, Zhi Zhu saw the thirty men who’d sworn loyalty to Kang, organizing the other soldiers, saying they knew what was going on. Back in the tent, Rong managed to kill San with Storming Daggers, while Lingsu used his secret Willow Manual technique, plunging his fingers into Chen and draining his life energy. Kang used the Bone Breaking Stick to smash in Chen’s face. Eventually they killed the remaining soldiers. Searching the room, Rong and Kang found the Key of Yao Feng and the Phoenix Crown of Bao. Long look the Crown, while Kang took the Key. Stepping outside the tent, all the soldiers kneeled and shouted “Bandit King!”. The thirty who had sworn loyalty, remained loyal and convinced the other soldiers to take Kang as their leader. He addressed them and had each one swear allegiance to him. Then they organized a feast and the soldiers got drunk. Monkey was furious but a gaze from Bing caused him to stay his rage. He said Zhi Zhu was a brat and too bold. He also suggested he’d kill her if he wasn’t in such a compassionate mood. Then he left in a huff to the south. 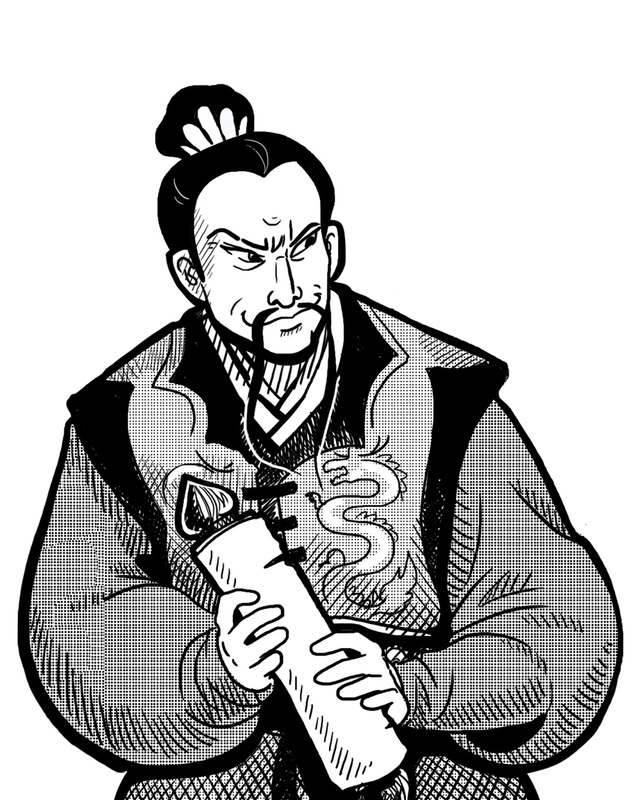 After she returned to the encampment, Zhi Zhu informed the party what had happened with Monkey, Lingsu was angry. He and Baku went to track Monkey, finding him angrily carving an image of Zhi Zhu into a tree. It took time, but Lingsu convinced Monkey to help him by going to Purple Cavern and guiding the entrance in his absence. He even sent a disciple with him. Returning back to the encampment, they discussed their next move. Kang sent most of the soldiers back to Bone Fortress to guard the Face of Vaagu. They discussed recent rumors that Lingsu had heard, saying that Lady White Blade had returned. There were also reports of beheaded Tree Dwelling Nuns in the North. While they were talking, a disciple Lingsu had instructed to gather information arrived and told him they found ten beheaded Tree Dwelling Nuns half a day away on the road from Zun City. Because Rong belonged to Tree Dwelling Nun Sect, they decided to investigate. They found ten dead Tree Dwelling Nuns, each with their head severed. Long found indications that the bodies were dragged to the road from the woods and followed the trail. There she spotted the characters for White Blade etched into the earth. They also found a trail leading south. Lingsu remained with the bodies, inspecting them. He inspected the wounds, and could discern that the heads were severed by two blades intersecting. He also found that three had stab wounds in their chest and stomach. Lingsu rejoined the group and they followed the trail, finding it led to the Fragrant Petal (Madame Hamaya’s Brothel*). Zhi Zhu crept onto the roof. Kang, Baku and Rong went inside, where a woman greeted them and gave them seats in the hall (there were lots of people here dining and enjoying music). Kang ordered chicken and asked for a singer to perform for them. Lingsu had remained slightly behind, inspecting the courtyard. Kang looked around and spotted a woman peering at them from a room on the second floor. She resembled Lady White Blade. He also noticed people in white robes lingering beyond many of the other doors on the second floor. The party leapt up and immediately six white robed figures stepped onto the balcony surrounding the hall, lowering strange weapons at their sides. Later the party would learn these were Flying Guillotines. The woman resembling Lady White Blade fled into the chamber door. The figures tries to land their guillotines on the heads of Rong and Kang but missed. Rong stormed up the steps, using Blasting Blade to unleash a spray of debris against two of the figures in white (dropping both). Kang went up the opposing stairway and dropped one with his Bone Breaking Stick. Baku jumped onto the Balcony with Leap of the Swan and used Strike of the Divine Falcon to grab and slam another white robed figure into the hall floor. Going after the woman who resembled Lady White Blade, Rong made it to the Window to see her fleeing toward a cliff. Zhi Zhu, who was on the roof, used Arms of Silk to ensnare the woman. She resisted but Zhi Zhu forced her to talk by squeezing. The woman said her name was Nuan, and as she did her face changed from that of Lady White Blade to a face neither of them recognized. She admitted to working for Master Ta, who was Dancing Hawk’s uncle and wanted revenge against the party. Further pressing forced her to admit that she was a member of Golden Dragon Sect. Zhi Zhu let her loose when she promised to teach her the Shift of the Chameleon Technique (the skill she’d been using to disguise herself as Lady White Blade). She began instruction but once Zhi Zhu completely loosened her Arms of Silk, the woman attacked Rong, delivering a potent stab to the belly. Rong replies with Storming Daggers, which finished the woman off. Lingsu made it into the hall and spotted another woman in White flying through another chamber door. He gave chase and spotted her fleeing through a window into the woods. Kang followed. When Lingsu reached the woman in a clearing, she paused and two more figures with Flying Guillotines stepped from the woods. A battle broke out, but with Kang’s help, Lingsu was able to kill the figures and take the woman prisoner. She made a similar confession to the other, but told him that Bronze Master was also behind it, that they worked with Master Ta to help engineer the weapons. The woman told them her name was Cui, and Lingsu let her live (but placed a blindfold on her). They then discussed their options. They thought of attacking Master Ta right away but decided to go get help from Tree Dwelling Nun Sect and from Kang’s newfound soldiers. They also sent Baku to scout the mountain for Bronze Master (who they thought might have tried to escape if he received word of their attack on the Fragrant Petal). Baku went south to scout the Mountain. He took a horse from the stables and managed to find Bronze Master sneaking through the woods (he’d rolled a Total Success on his Survival Roll to track). He approached Bronze Master, who had never met him, and said he was a traveler from the north looking for someone to join him on his journey. Bronze Master smiled and greeted him, offering him food or aid. He said he’d be delighted to have a Kushen as company and suggested they made their way to the neighboring city. Once there, Bronze Master brought them to a fine Tea House and ordered exquisite foods and teas for them to dine on. The two talked, with Baku avoiding any mention of his party members or their experiences. 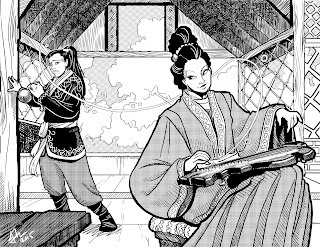 Kang and Zhi Zhu headed north west to their encampment. On their way they were intercepted by four more figures with guillotines (Cui had mentioned that Bronze Master had about 40 of them in the area). This fight was much closer with Kang narrowly escaping the guillotines with his counters on at least three occasions. However between Tai Lan’s Staff Strike (one of Kang’s techniques) and Zhi Zhu’s stealth, they made short work of them. Rong and Lingsu went west, to the Tree Dwelling Nuns. *Madame Hamaya was someone they killed in their very first session, which caused her lover, Dancing Hawk, to come after them.